I’m always on the lookout for fascinating plants that are a little bit different to the norm. When I heard about this climber, the cup and saucer vine, I decided to find out more about it. It’s latin name is Cobaea Scandens and it is also known as cathedral or monastery bells or Mexican ivy. I can see why it’s called the cup and saucer vine because of the beautiful flowers that resemble a cup or a bell. It originally comes from Mexico so you wouldn’t think that it would be very at home in our cooler climate. When we grow it in this country we should treat it as an annual, although it is half-hardy and can be over-wintered in a warm greenhouse or conservatory. We wanted to grow something against an old fence but needed something quick growing. We think that this fence will be replaced at one point so we didn’t want to grow anything permanent. An annual climber seemed ideal to cover it quickly. 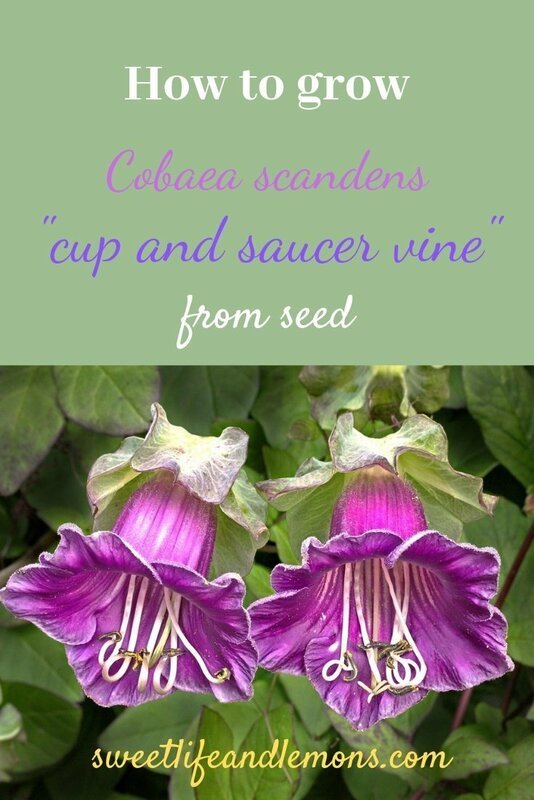 I came across the cup and saucer vine and thought it looked beautiful, so I purchased some seeds. Honestly, I didn’t really expect to have much success with them but I’m happy to say I was very wrong. I planted them in my recycled plug trays filled with choir compost. 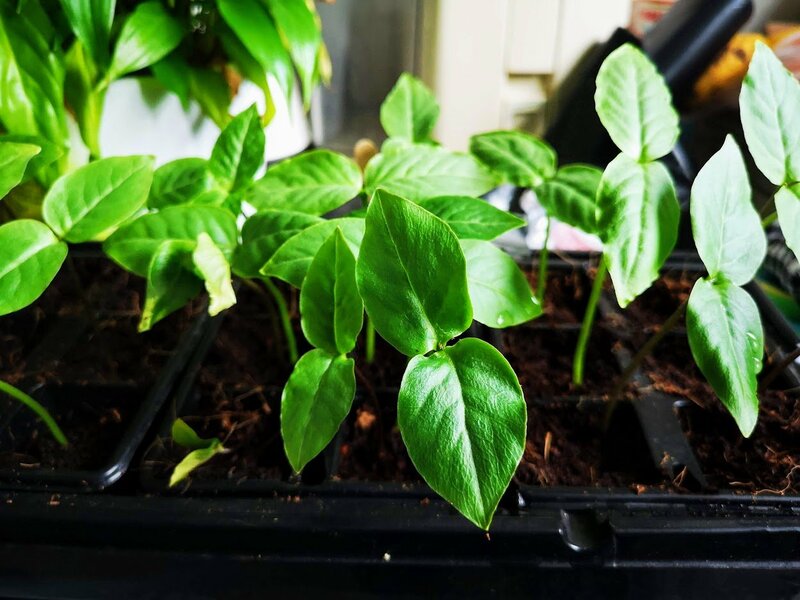 I didn’t soak the seeds and didn’t really know how deep to plant them so I loosely covered them with soil and placed them on our kitchen window sill. The seeds sprouted after a few days! Wow, the packet said that it would take a week at least so I’m really pleased they germinated so soon. I have read that ideally you should soak the seeds before sowing. Although mine grew very quickly without having soaked them, it may be a good idea to follow this advice. Update: after another week of growing on my windowsill, the seedlings are a lot bigger and tougher looking. 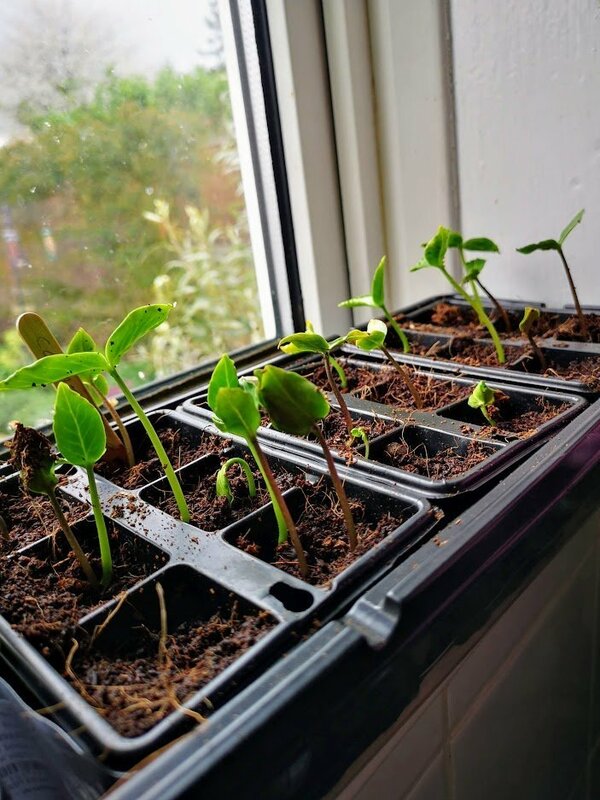 At this rate I will have to pot them on quite soon and hope that I can find some more space on another windowsill before planting them outside. Until all danger of frost has passed, I will have to keep them on a warm and sunny window sill. Apparently this is a quick-growing climber that can reach 3m (10 feet) and produces 8cm long bell-like flowers. It’s best to support the plant, which produces tendrils to cling onto the support. They like full sun and well-drained soil. You can help the vine by training it onto a trellis or support as it grows. Pinching out the tip of the vine will make it grow lateral shoots. You can buy seeds or seedlings here, or click the advert below. I have found their customer service to be very good. They also stock a lovely white variety called ‘alba’. This is a perfect plant if you want to cover an ugly wall or trellis very quickly. Just make sure the plant gets as much sun as possible and that it is fairly protected. Soil should have good drainage and keep it moist especially in very dry weather. The flowers can also be picked for flower arrangements and look great together with rosemary or you can float the blooms in a shallow bowl. I will let you know how my seedlings progress and hopefully I can report some success. So far the experience has been better than expected, I probably expected it to be more difficult because this plant looks so exotic. Which is another example why you should just try anything in gardening, most of the time you will be successful. I hope this post has given you the confidence to try growing this beautiful plant or maybe something similar. Let me know if you have tried or are going to try growing this plant, I’d love to hear about your experiences. PS. One small request: if you enjoyed reading this, please share it 🙂 A share would really help a lot with the success of this blog. It won’t take long and I would be so grateful. Please pin, tweet or share on Facebook. Thank you so much! A very warm welcome to Sweet Life and Lemons! My name is Nuria and together with my husband Darren, we decided to turn our boring unusable back garden into a beautiful space we can relax in and enjoy. We had no gardening experience at all, and we made many mistakes along the way, but we persevered and learned along the way, and we transformed the space to how we wanted it to be. How my blog can help you. Darren and I had no gardening experience. We liked gardens but we had no idea how to make one or how to look after one. Despite the odds, we made a beautiful garden, our little corner of paradise and I want to inspire others to do the same. If we can do it, so can anyone! I really want to help other people with little or no gardening experience to achieve their dream. If we can do this, so can you! You may want to transform your whole garden or you may just want to improve a little corner, whatever project you are planning, I want to help you achieve it. We made a lot of mistakes, so you don’t have to! Don’t get me wrong, every gardener will make mistakes and that’s how we learn, but it helps to avoid the obvious ones and I can help you with that. I hope you enjoy reading this blog about gardening, getting the most out of life and about places worth visiting. I hope Sweet Life and Lemons can be your little sanctuary to escape to and to draw inspiration from. Download your FREE Monthly Gardening Planner! Get this helpful guide to some of the important monthly jobs to do in the garden.